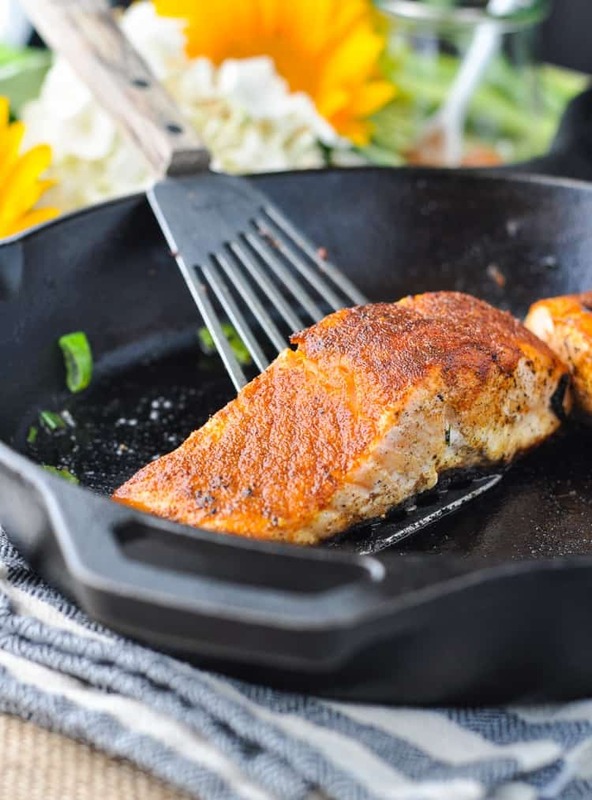 Spice up your next healthy seafood dinner with this easy 5-Minute, 5-Ingredient Blackened Salmon! It's a classic Southern favorite that's crispy on the outside, moist and buttery on the inside, and loaded with zesty Cajun flavor! 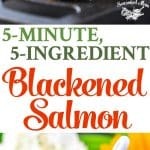 Spice up your next healthy seafood dinner with this easy 5-Minute, 5-Ingredient Blackened Salmon! It’s a classic Southern favorite that’s crispy on the outside, moist and buttery on the inside, and loaded with zesty Cajun flavor! Oh, honey. I just wanted to jump through my iPhone and feed her a plate of this Blackened Salmon. Trust me…it’s anything but boring! If you love spicy food, then this is the dish for you. It’s definitely spicy, but you can completely control the level of heat by adjusting the amount of cayenne that you use. In fact, when I’m preparing this Blackened Salmon for the family, I just omit the seasoning altogether. This is one of those great meals that can easily be accommodated for everyone around the table without having to make an entirely different meal. The kids’ salmon is just sprinkled with salt, pepper, and garlic powder. 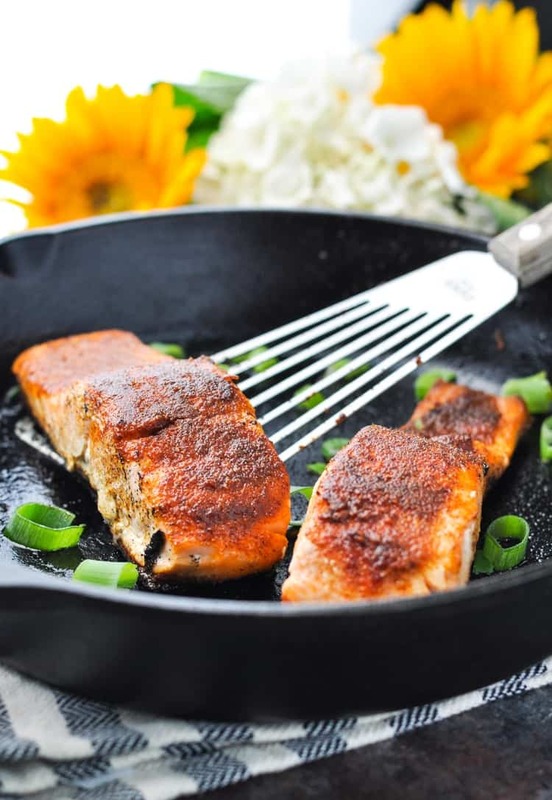 Then I cook it in the skillet exactly the same way that I cook the Blackened Salmon for us. No extra work, no extra dishes to wash, and a healthy family dinner that we can all enjoy! So go ahead — skip the boring salmon and take a trip down south. You’ll never look at this healthy fish the same way again! 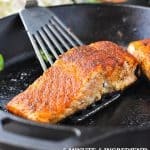 With some coleslaw, grits, or cornbread on the side, my easy 5-Minute, 5-Ingredient Blackened Salmon will instantly transport you to New Orleans! You can cut the ingredients in half and just cook 2 salmon fillets. The cooking process remains the same. 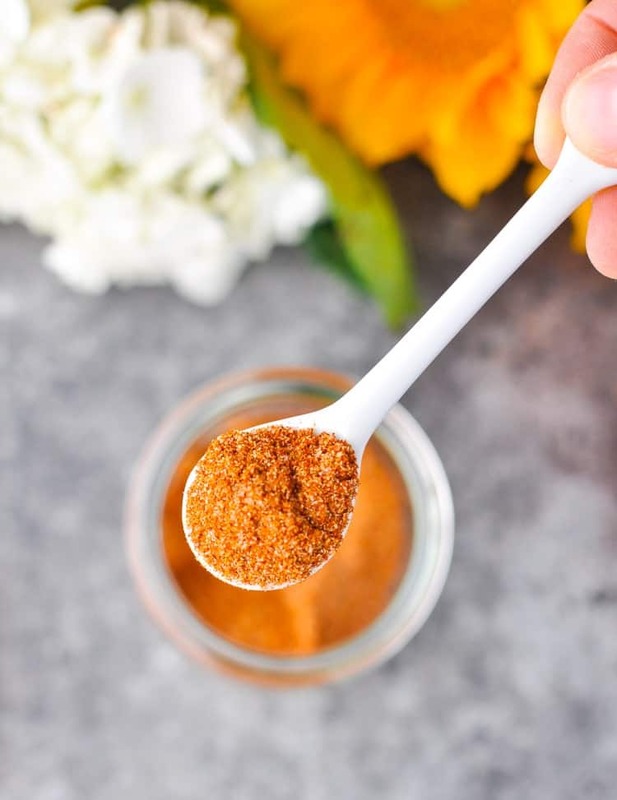 If you prepare a full recipe of seasoning, just save the extra spice for another meal. In a shallow bowl, mix together cumin, smoked paprika, cayenne, garlic powder, salt and pepper. Pat seasoning mixture onto the flesh side of each piece of salmon. In a large skillet, heat about 1 tablespoon of olive oil over medium heat. Place salmon, flesh-side down, in the hot oil. 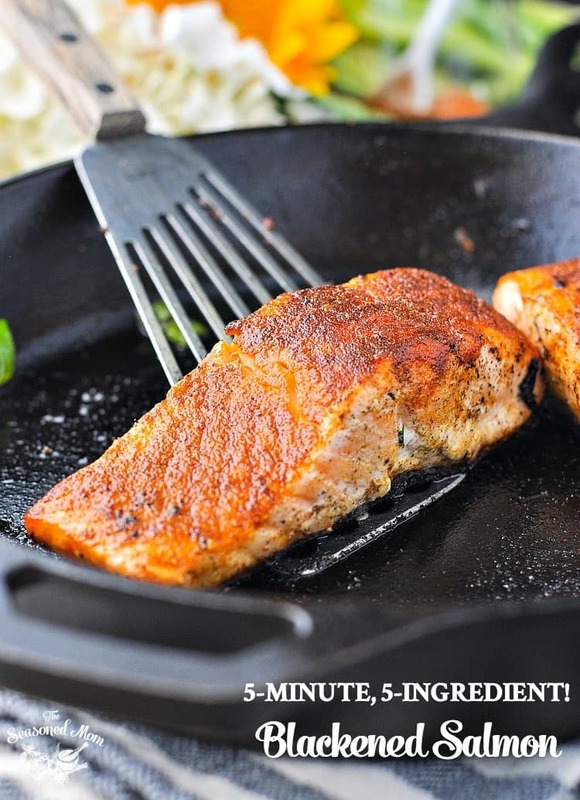 Cook for 2-3 minutes, and then flip salmon with a spatula. Cook for about 5-6 more minutes, or until skin becomes crispy and fish flakes easily with a fork. Cooking Just for Two? You can cut the ingredients in half and just cook 2 salmon fillets. The cooking process remains the same. 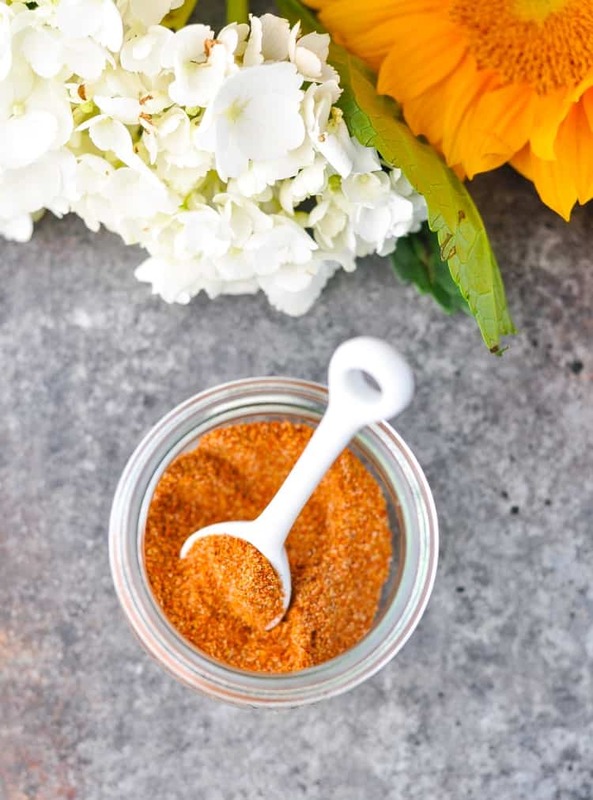 If you prepare a full recipe of seasoning, just save the extra spice for another meal. You are so right, salmon is anything but boring! I make it all the time for my husband and I, so I’ve got to try this version! Love how easy it is, Blair! I have never been a salmon girl. I am a big seafood person. I will have sandwiches out of a can but a filet no. I have picked off everyone’s plate for a taste in very expensive places. Have been sick recently & have been “receiving Meals On Wheels”. You never know what you are getting. Salmon turns up not so impressed. Well I loved it???????? So Blair look forward to trying this. That’s awesome, Jeanette! It’s never too late for our tastebuds to change!! So glad that you’ve been treated to some homemade meals while you’re recovering, too! I’m up in my summer house in Alaska with a freezer full of Salmon that was given to me. Bless my neighbors Heart. I didn’t even have to clean it. LOL. This recipe looks so amazing that I have to try it. I love Salamon and am always looking for new ways to prepare it.. Thanks so much Blair for all you fabulous recipes. Wow — lucky you! Salmon is one of our favorite foods, so I can only imagine how delicious the fresh-caught version is! I hope that you enjoy this easy recipe, and have a great vacation! This was a quick, delicious dish. It only took me about 20 minutes to prep 4 small salmon portions and throw in green beans as a side. Oh, I sprinkled parmesan cheese om mine for a good zest and texture! Thanks for sharing. This is the recipe that I’ve been dreaming of finding – delicious. Thank you! Simple and delicious! Alaskan sockeye salmon is my favorite! The sous vide method is yummy too, just sear it afterward in a cast iron pan. Hi Blair can I make this recipe in the oven as well. Hi, Tania! Yes, you can definitely bake the salmon in the oven. Here’s a link to a baked salmon recipe in case you need specific instructions. Enjoy!